I know we’ve been over this, but I am beyond excited for the new Beauty and the Beast movie to premiere this Friday!! 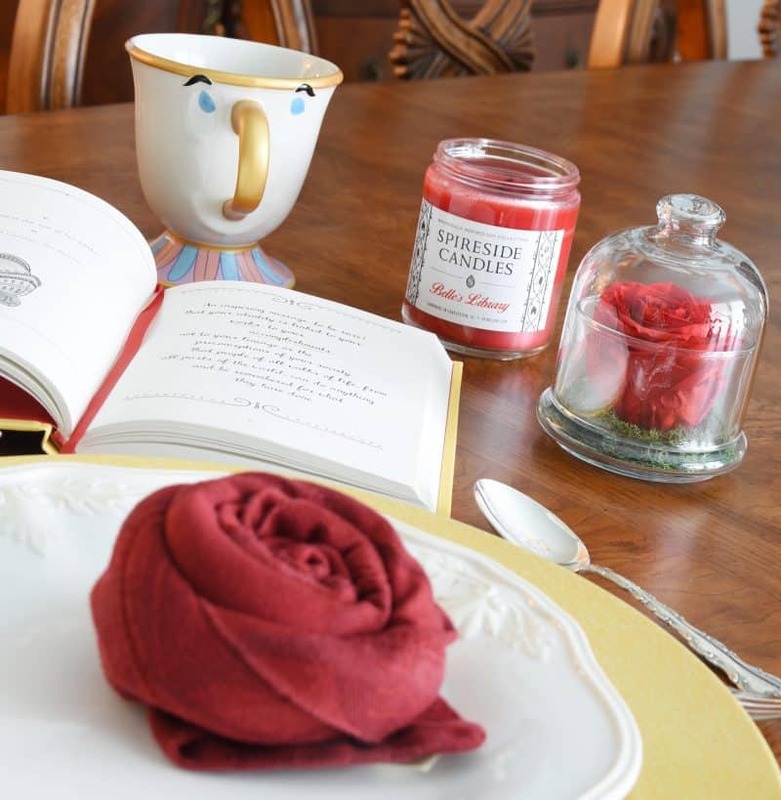 I pulled together a Be Our Guest inspired table top to share with y’all today. Be Our Guest in Magic Kingdom is my very favorite restaurant on property. It’s such a magical experience from the moment you walk through the grand and foreboding double doors of Beast’s castle. 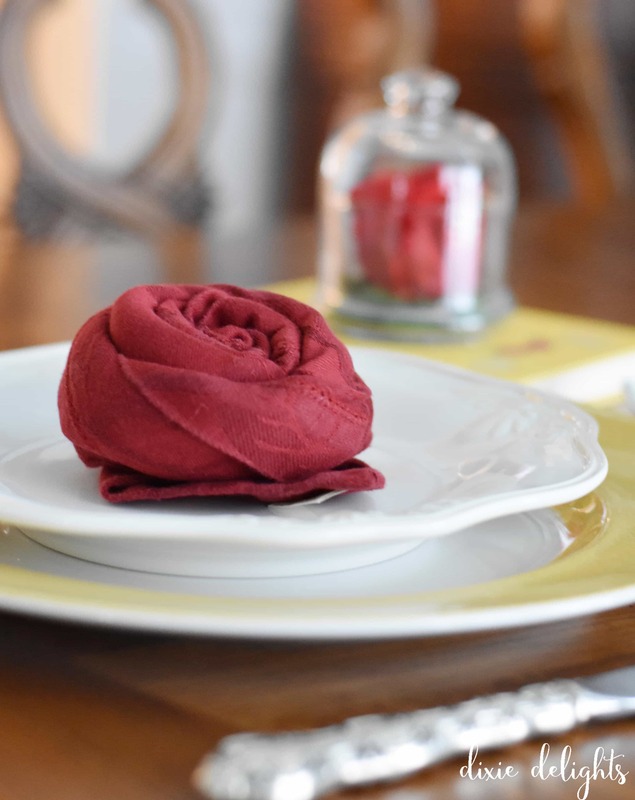 The dinner tables are set with a rose napkin and I knew I had to add that to my table. 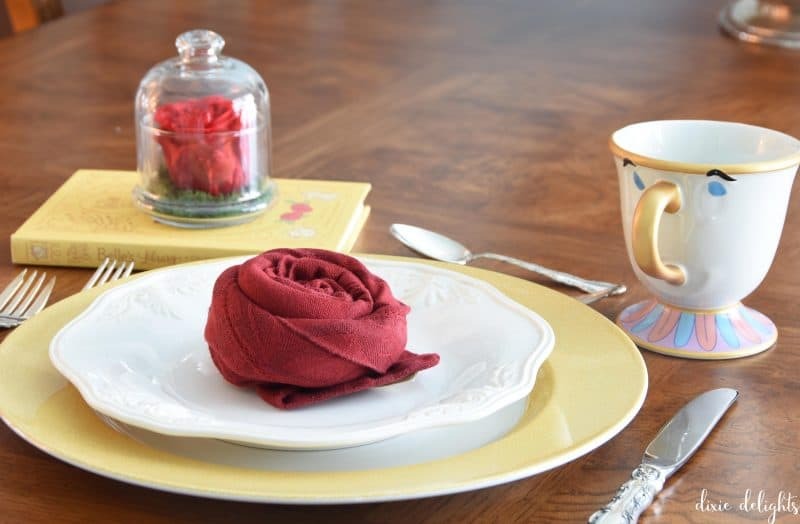 I shopped my cabinets for the china for this place setting. The yellow chargers are Spode and we’ve had them since our wedding, although they don’t come out to play too often. 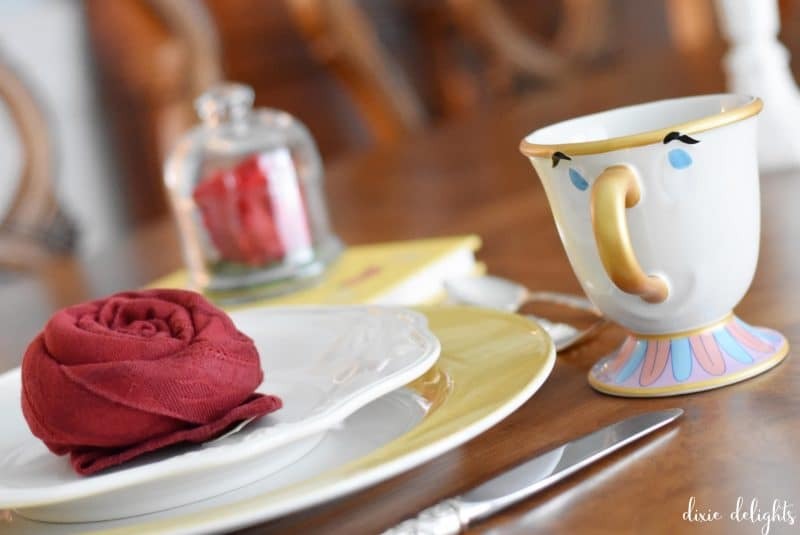 When I think of Beauty and the Beast, Belle’s iconic yellow ball gown always comes to mind. The white scalloped plates are Butler’s Pantry by Lenox. 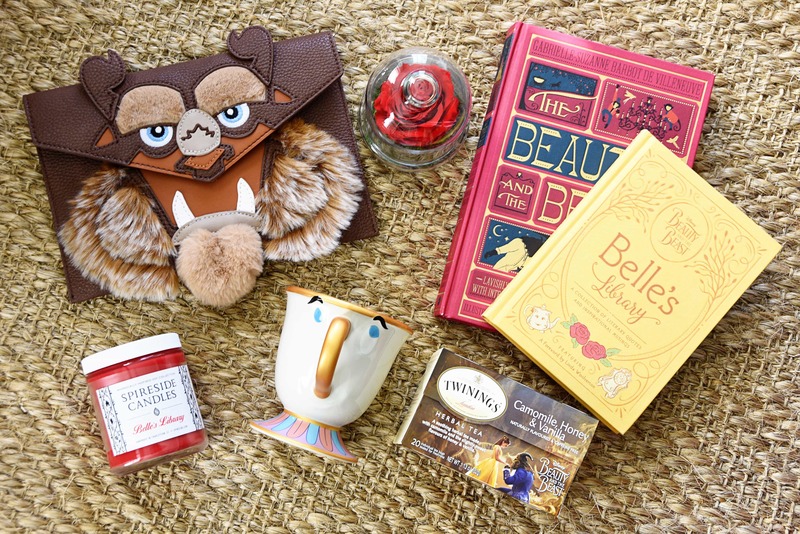 I added in my stunning Luxe Bloom Enchanted Rose, Chip mug and the inspiring Belle’s Library book. One of the qualities I love most about Belle is that she always has her nose stuck in a book. Daddy-O told me when I was very little that it was very important to learn to read because I could go anywhere, do anything and see everything in a book. I feel like Belle wouldn’t set a table for one without a book. In fact, one of my very favorite treats is to eat alone with my meal on china and a book in my hand. 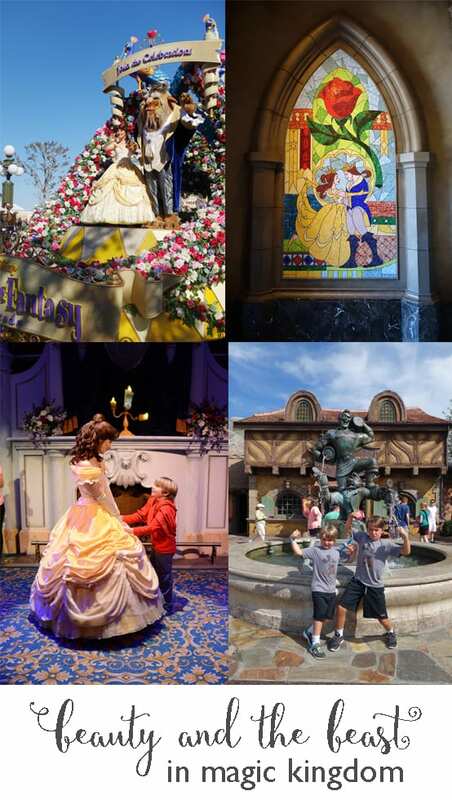 As an independent consultant with Glass Slipper Concierge, an Authorized Disney Vacation Planner, I offer concierge travel planning for Walt Disney World® Resort, Disney Cruise Line, Disneyland® Resort, Adventures by Disney®, Aulani and other delightful destinations. Start designing your dream vacation today! Such a darling setting. Always love seeing your sweet videos. This is fabulous in so many ways! You have inspired me and I will be doing this for an upcoming 80th birthday celebration for a dear friend. Thank you for sharing the technique and your perfect table setting. Your creamy yellow chargers are gorgeous! I’m so glad!! They are really easy and look SO nice. Yes, Daddy-O was so right about the whole books thing. I am still a bookworm. Thank you!! I’m excited too. I don’t go until next Tuesday!